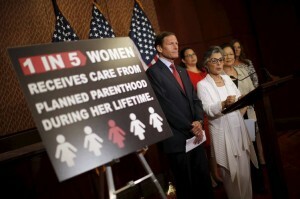 Democrats block measure to strip women’s health organization of federal funds. A measure that would strip Planned Parenthood of federal funding stalled Monday in the Senate, casting doubt on prospects for hobbling the women’s health organization. The 53-46 vote blocked a motion to begin debate on the bill, which would prevent the government from funding Planned Parenthood, one of the nation’s largest providers of reproductive health care. The vote was largely along party lines, falling short of the 60 votes needed for the legislation to advance. The bill was introduced in the Senate last week following the release of a series of undercover videos depicting Planned Parenthood officials discussing how tissue from aborted fetuses is provided for medical research. Planned Parenthood has apologized for the tone used by officials in the videos but said it has acted lawfully. “Tonight, the Senate sent a clear message: blocking millions of women, men and young people from seeking care at a Planned Parenthood health center is a political non-starter,” Cecile Richards, Planned Parenthood’s president, said in a statement. Two Republicans joined 44 Democrats in opposing the legislation, one of them Majority Leader Mitch McConnell of Kentucky in a procedural move to be able to bring the measure back for reconsideration. Sen. Mark Kirk (R., Ill.) also voted no. He joined Sen. Susan Collins (R., Maine) in introducing an alternative measure—which they would have offered as an amendment if Monday’s cloture vote had carried — requiring the Justice Department to investigate whether Planned Parenthood engaged in illegal activities pertaining to fetal tissue. Under federal law, fetal tissue cannot be sold for a profit, but it can be provided for research after meeting certain criteria. The measure would have defunded any unit of Planned Parenthood that violated the law, Ms. Collins said. Sen. Joe Manchin of West Virginia and Sen. Joe Donnelly of Indiana broke with fellow Democrats in voting to try to advance the legislation. “Until these allegations have been answered and resolved, I do not believe that taxpayer money should be used to fund this organization,” Mr. Manchin said in a statement Monday.